Canton Village Quilt Works has been in business since 2000. They started as a long arm business. As they grew, they began design work, teaching, and selling fabric, kits, notions, and more online in 2009. Quilting is their passion and fabric inspires them. They want to bring to you the best quality and most gorgeous fabrics that the industry has to offer so that you can be inspired in that next project of yours. Education is a key part of CVQW. Passing along tutorials, podcasts, and traveling to teach and lecture helps them to continue inspiring all quilters alike. CVQW is a Judy Niemeyer Certified Shop (CS) and Jackie Kunkel, the owner, is a Certified Instructor (CI). At CVQW they are continuing to learn to bring you only the best! They welcome all quilters to peruse their site and hope that their products will be in your next project... they would love to see what you have made!! 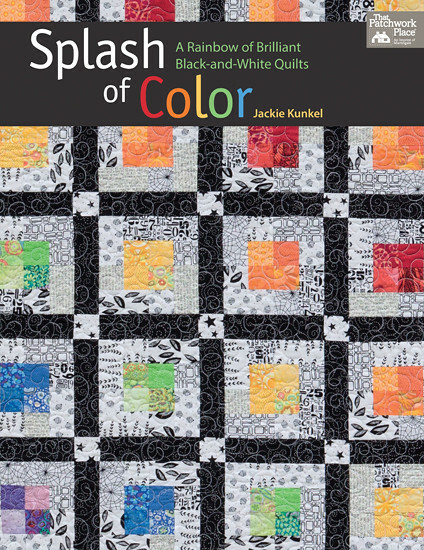 Jackie also has her first book coming out this October (2015), Splash of Color, A Rainbow of Brilliant Black and White Quilts! Congrats, Jackie, how exciting!! 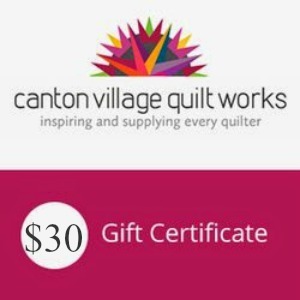 We hope you enjoy visiting Canton Village Quilt Works!! 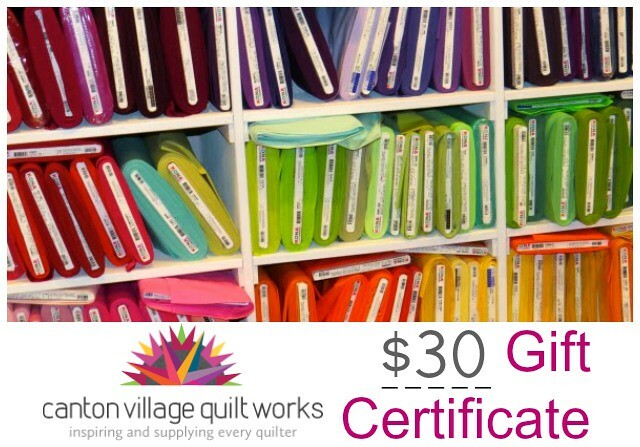 For this week's Giveaway, Jackie at Canton Village Quilt Works is offering up a generous $30 Gift Certificate to her wonderful shop! The winner will be picked at random and I will announce their name at the bottom of this post, here on my blog! Thanks to all who enter our Giveaway!! From the 469 comment entries, comment #198 was chosen at random, making this week's winner, barbara woods! Congratulations Barbara, I will be in touch shortly!! Oh!! That book looks like it will be brilliant!! Black and white with a splash of color? perfection! I'm so glad you shared it, I just put it on my "watch for it to come out" list!! LOVE b&w quilts....can't wait for October. My love is lap quilts and baby quilts. I like for my quilts to look as colorful as yours! Thanks for sharing and for your giveaway. I follow Jackie's blog and get her newsletter. Yes Miss Maureen I follow you and your wonderful creations every chance I get!!! Hugs!!! Looks like a great book, I will add it to my must read list. What a great giveaway!! Thanks!! Happy Fourth of July to you and your family. thanks for the generous give away! Happy 4th of July! I follow canton on facebook. Of course I follow you! I love your posts and information. Thank you. I follow Canton Village on FB and their blog. Great giveaway for the holiday weekend! I follow Canton Village on Bloglovin. Thank you you for a chance to win! i follow you on feedly and on IG. Congrats Jackie on your first and upcoming Splash of Color book. Maureen I follow you on Bloglovin, by email. Thank you always for sharing your passion for making pillows..I've made 3 HerringBone patterned pillows. Love that inspiration and easy of instruction you have. Happy 4th! Jackie's shop has such a great selection! Just looking at those rows of pretty solids is exciting :). I hadn't met this shop before. She seems like a lot of fun from what I've read on her blog. And of course I follow you. Of course! I follow Jackie's blog and Facebook. I follow Canton's blog. Thanks for the chance to win! Jackie's new book looks great. Love black and white quilts! I follow Jackie's FB page. What a fun looking book! I love that it has a touch of whimsy with they way they use color. I love all the bold colors! I follow the CVQ blog via GFC. Maureen, I follow your blog and I follow you on Facebook as well. Love, love , love your projects! I would love to win some fabric. The book looks great too! New to your blog but loving it. I follow you on Bloglovin, by email, and on Instagram! I Love the title of Jackie's book! It is so clever and sounds so interesting! I'm looking forward to getting to read it! I follow Canton Village's Blog! Great giveaway Happy 4th everyone. What a great giveaway. Canton is awesome. The book looks great! I love color on black and white. Thanks for the chance. I follow the Canton Village Quilt Works Facebook page. What a beautiful selection of solid colors! I follow you all three places! Book looks great! Happy 4th too! Whooohoo, great giveaway this week. Thank you for all you do and enjoy the fourth! happy 4th! thanks for hosting such fab giveaways each week. I follow CVQW on her blog, fb and emails. I follow Maureen on fb. Love the quilt on the front of Splash of Color. I follow Canton Village Works. I'm anxiously awaiting that book. I like the cover quilt. Splash of color looks great! Nice prize - thanks for the chance to win! what a cool giveaway, hope you're having a good day! I follow Canton Village's blog. I always need more fabric!! I love Canton Village Quilt Works! I follow Canton Village's blog and FB page. I follow Canton Village Quilt Work's blog and Facebook page. I follow you via e-mail & Facebook. Looks like a great book - love B&W quilts. I really enjoy receiving your posts by email. Thank you for having this wonderful give away! I do follow Canton Village by email! Love the site! Thanks for sharing and having this great give away! I also follow Canton Village on Facebook! Have a great day! I follow you both by email posts and on face book! Your site is great! Thank you again for sharing and having this give away! Have a wonderful fun and safe 4th of July Weekend! Jackie's new book sounds great. Can hardly wait to check it out. Her new book looks wonderful!!! Love black and white quilts with color pops! Beautiful colors and nice contrast with the blacks! I follow Canton Village on Bloglovin. Thanks! Maureen, I follow you on Facebook & your Blog. I'd use it on a Judy Niemeyer paper piecing pattern they're having on Canton Village Quilt Works, I've admired them for quite some time... Thanks for the chance! I follow Canton Village Quilt Works on FB and on Blogger. And I follow you, on FB and on Blogger. Ooh I love finding new places that ship internationally! Defo one to bookmark! Thanks! Annnnd I now follow candon village Quilt works! Thanks for the giveaway! I follow your blog by email and I follow you on FB too. I follow Canton Village Quilt Works by email and on FB, too. Very nice giveaway prize! Thank you and Canton Village Quilt Works for this opportunity. Thanks for the prize offering! I follow them on fb. I follow you in fb and Bloglovin. I follow Canton Village Quilt Work's blog.